Democrats Make Historic Pick: It's Obama Barack Obama sailed into history Wednesday as the first African-American to head a major-party presidential ticket. Prompted by Hillary Clinton, the party nominated him by acclamation. And after VP pick Joe Biden spoke, Obama joined him onstage. As the Clintons moved to end doubts about backing Barack Obama, the animosity of the primary season seemed to fade from memory. Trace some of the steps that brought the 47-year-old senator from Illinois to this historic nomination. Former President Bill Clinton said Obama is "ready to lead America," and he praised Obama's selection of Joe Biden as a running mate, saying "he hit it out of the park." 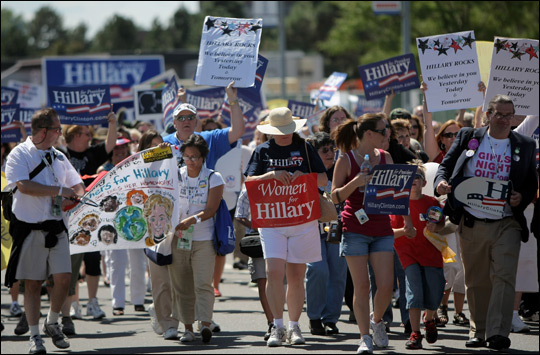 Supporters of New York Sen. Hillary Clinton march from Civic Center Park to the Pepsi Center at the 2008 Democratic National Convention in Denver on Tuesday. Read the latest posts from the Democratic convention at the Vox Politics blog and add your thoughts. Democrats Wednesday formally made Sens. Barack Obama of Illinois and Joseph Biden of Delaware their 2008 presidential and vice presidential nominees, a historic ticket they hope will recapture the White House after eight years of Republican rule. It marked the first time that a major party has nominated an African-American as its presidential nominee. In an unscheduled bit of stagecraft, Obama briefly joined Biden onstage at the Pepsi Center, after the vice presidential nominee had revved the crowd up with his acceptance speech. "I think the convention has gone pretty well so far. What do you think?" Obama said, as delegates cheered and waved. Obama and his running mate embraced as members of Biden's family filed onto the podium. Earlier in the day, Obama officially secured his party's nomination after a dramatic, but carefully arranged show of party unity from Sen. Hillary Clinton, whom Obama narrowly defeated after a long and at times divisive primary campaign. Clinton called on the assembled delegates to unanimously support Obama by acclamation. Later, her husband, former President Bill Clinton, delivered a forceful speech of his own, asserting, "I am here first to support Barack Obama." In his address accepting the vice presidential nomination, Biden talked about his upbringing in Pennsylvania and Delaware as the middle-class son of a car salesman. He said his father fell on hard economic times, but always told him: "Champ, when you get knocked down, get up. Get up." Biden called Obama the great American success story. "You learn a lot about a man debating him," Biden said of Obama, his onetime rival for the nomination. As he praised Obama, Biden also carried out the traditional running mate's role of taking on the opponent, presumptive Republican nominee John McCain. Biden called McCain, his longtime Senate colleague, a friend, and noted the Republican's sacrifice as a prisoner of war in Vietnam. 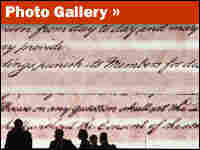 But he said the challenges that the nation faces "require more than a good soldier." Biden criticized McCain's foreign policy judgment on issues ranging from Iraq and Afghanistan to Georgia. "Again and again, on the most important national security issues of our time," Biden said, "John McCain was wrong, and Barack Obama was proven right." Biden and Obama's end-of-night appearance together capped a day filled with theatrical moments. Chief among them was Clinton's call during Wednesday's roll call of the states to give Obama the nomination by voice vote. 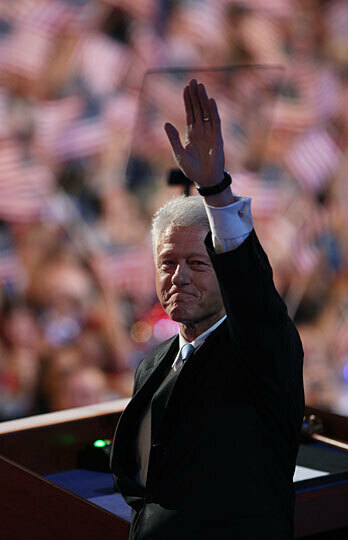 "Let us declare together in one voice, right here and right now, that Barack Obama is our candidate, and he will be our president," Clinton told the delegates on floor. It was a gesture that moved many in the convention hall to tears. Clinton's and Obama's names were both formally placed in nomination shortly after Wednesday's session of the convention began. There were nominating and seconding speeches, and then the traditional roll call of the states. As the roll call reached New Mexico, a carefully choreographed dance arranged by the Obama and Clinton camps played out. New Mexico's delegates yielded to Illinois, Barack Obama's home state, which in turn yielded to New York. As TV cameras focused on the floor, Hillary Clinton walked through the throng and asked that the rules be suspended and Obama be nominated by acclamation. The chair of the convention, House Speaker Nancy Pelosi, then asked the convention for those in favor of the motion to vote "aye." A chorus of "ayes" rang through the hall. Pelosi then asked if there were any nays. Before anyone so inclined could respond, Pelosi banged down her gavel, settling the question. That ended a delicate, drawn-out process between the Obama and Clinton camps. Clinton wanted to make sure her supporters got their due. Obama's campaign wanted to avoid divisive grumbling that it feared would hamper his efforts to win the White House in November. 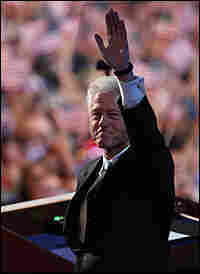 Wednesday's second Clinton moment came a couple of hours later, when former President Clinton addressed the convention. Answering those who say he has seemed tepid in his support for Obama, Clinton told the crowd, "Last night, Hillary told us in no uncertain terms that she is going to do everything she can to elect Barack Obama. That makes two of us." Calling him the man for the job, Clinton said Obama has the intelligence and curiosity every president needs and has shown a clear grasp of foreign policy. The former president said Obama is "ready to lead America," and he praised Obama's selection of Joe Biden as a running mate, saying, "He hit it out of the park." Clinton made parallels between his campaign 16 years ago and Obama's, noting that in 1992, he, too, was painted as being too young and too inexperienced to occupy the Oval Office. "It didn't work in 1992, because we were on the right side of history," he said. "And it will not work in 2008, because Barack Obama is on the right side of history." Obama has his own date with history Thursday night, when the convention scene shifts from the Pepsi Center to Invesco Field at Mile High, the football stadium where Obama will deliver his acceptance speech. During his brief appearance at the Pepsi Center Wednesday, Obama said the goal was "to open up this convention to make sure that everybody who wants to come can join in the effort to take America back." Some 75,000 people are expected to be in attendance. Obama's speech comes at a historic moment, the 45th anniversary of the Rev. Martin Luther King Jr.'s famous "I Have a Dream" speech, in which he outlined his goals for a colorblind society. As the nation's first major party African-American presidential candidate, Obama is well aware of the parallel. He is also doubtlessly aware of the last time a presidential nominee made an open-air acceptance speech, John F. Kennedy's address at the Los Angeles Coliseum in 1960.